Almost a month ago to the day was a particularly special day for Virgin Australia – and of course its discerning customers. What made this day so special you ask? 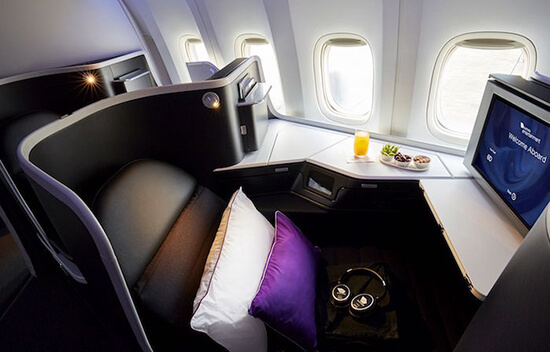 Well, after seven years of operating flights from Australia to North America, this trans-Pacific airline made the decision to give its Premium Economy and Business Class cabins a brand spanking new overhaul – and we couldn't be more excited. Firstly, let’s talk about reverse herringbone. No, it's not a complicated gymnastics move more akin with the Rio Olympics. In fact it's the new seat layout that Virgin Australia has adopted for its Business Class cabins. The benefit of this new layout is that it maximises storage for the customer, offers fully lie-flat beds and, most exciting of all, is that it gives each passenger direct aisle access, so there's no awkward shuffle past your neighbour during the night. A lot of modern fleets have this reverse herringbone design but Virgin Australia have gone a step further with larger TVs, a wider seat pitch at 24 inches, plus many other premium materials in line with the Virgin brand. By creating a “sumptuous cabin environment”, UK design agency Tangerine worked with a number of different materials and textures to create a beautiful area in which to truly relax in. Are you picturing yourself cosying down in the lie-flat bed en route to sunnier climes yet? I know I am. If the bank balance doesn’t quite stretch to Business Class then never fear; Premium Economy has also been overhauled! Enhancements include a wider seat pitch (from 38-41 inches wide), check-in via a dedicated counter, pre-boarding ahead of regular Economy Class passengers, plus guaranteed first meal choice – so there's no arguing over who gets what. Airlines are constantly looking at ways to woo the most sophisticated of travellers, whether it be with new innovations in cabins, award-winning menus or airport lounges more akin to a top London spa. There really isn’t a better time to seek out a bit of luxury. So go on, treat yourself. For our best Premium Economy, Business Class or First Class airfares, make an in-store appointment with one of our First and Business Travel Experts today, or check out the latest prices online before giving us a call.